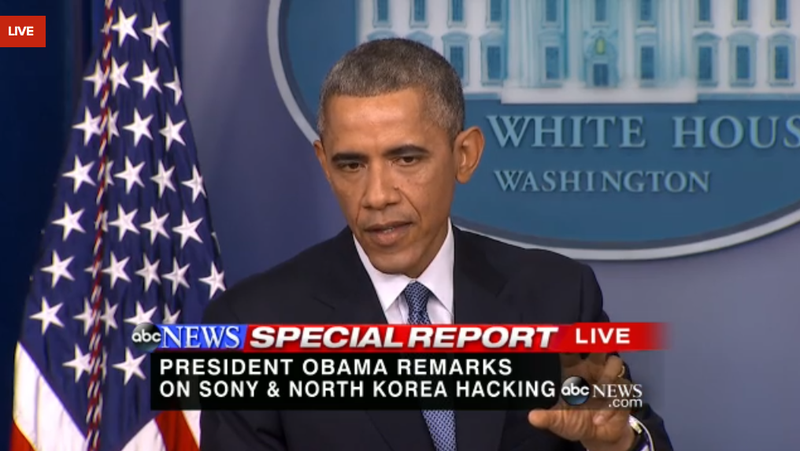 In a news conference today, President Barack Obama addressed the Sony hack and said that Sony's decision to pull the film was a mistake. "Sony is a corporation, it suffered significant damage, there were some threats against employees, I am sympathetic to the concerns that they faced. Having said all that, yes, I think they made a mistake," the president said. The president was referring to Sony's decision to pull The Interview, the Seth Rogen/James Franco satire about assassinating Kim Jong-Un. After the hackers explicitly demanded that the studio kill the movie, Sony acquiesced to the demands. The move prompted immediate criticism, since the decision to kowtow to the hackers lent credence to their threats of physical violence and made it clear that American companies are willing to negotiate with cyberattackers. Obama didn't outright call the Sony decision cowardly, but he was emphatic in his disapproval. He emphasized the danger in ceding to the demands of hackers, as it sets a dangerous precedent that could encourage a culture of intimidation and self-censorship. "If someone is able to intimidate folks out of releasing a satirical movie, think of what they can do if they see a documentary they don't like, or a news report they don't like," the president continued, noting that self-censorship was another concern. "That's not who we are. That's not what America's about," he said. "I wish they had spoken to me first," the president said about Sony. "Don't get into a pattern where you're intimidated by these kinds of attacks." Sony's decision is a white flag that will breed more threats, and the president's remarks are not going to reverse the damage the studio's overly ameliorative policy of accommodation. But they are a heartening sign that the government expressly discourages media from filtering stories, documentaries, and satire based on the whims of despots and trolls. The president confirmed the FBI's report that the attack was carried out by North Korea. "They caused a lot of damage. We will respond. We will respond proportionally and we will respond in a place and a time and a manner that we choose," the president said. "We are working up a range of options and they will be presented to me. "We have no indication that North Korea was acting in conjunction with any other country," the president said, quashing suspicions that the DPRK received assistance from China or other hostile government actors in its wide-ranging cyberattack. The president also characterized the internet as a "wild wild west" and called for tightened cybersecurity. "We need more rules about how the internet should operate," he said. Emphasis mine: With that statement, Obama pegged the Sony hacks to a vague clarion call for increased government control over the rules of the internet. While his insistence that accommodation is not the best policy was reassuring, tying this attack to a perceived need for increased regulation is wading into tricky territory. North Korea continues to deny that the hermetic country was involved with the hack.